Not everyone has been placated by these charming obfuscations. To Charlie Skelton, for instance, the Guardian’s Bilderberg correspondent, the private conference is obviously a “corporate lobbying event”, where the “financial, industrial and high-tech establishment” retained enough power to have “ministers and European commissioners come running” (Guardian, Jun. 07, 2016). For corporate representatives it was all about “getting a competitive edge”, to lobby the politicians and officials they now had access to; while for the people being lobbied it was “a chance to line up future employment” (Guardian, Jun. 08, 2016). 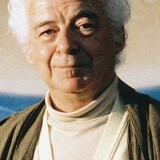 Paul Joseph Watson, a reporter for Alex Jones’ Infowars, described Bilderberg as a “powerful lobby group” and a meeting of the “most powerful people on the planet.” According to Alex Newman, from the John Birch Society, Bilderberg is “essentially a secret meeting of Big Business and Big Government” (The New American, Jun. 09, 2016). 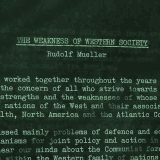 Looking closely at the two lists which accompany the brief but uninformative press statement, we can see how Bilderberg continues to function as its founder Joseph Retinger intended. Not as a front for corporate lobbying or a passive learning opportunity for the rich, powerful and influential, but as a vehicle for consensus-building within the trans-Atlantic elite with the ultimate objective of influencing policy, both domestic and foreign. The two lists suggests this vision remains intact; yet this year’s conference also reveals that part of the model has broken down with the third no-show in the past four conferences by members of the Obama Administration. Without senior US officials there to explain and discuss administration policy, or White House views on the 2016 presidential election in Bilderberg’s high-powered but confidential setting, Bilderberg’s aim of influencing policy-making in the US and Europe appears to be compromised. 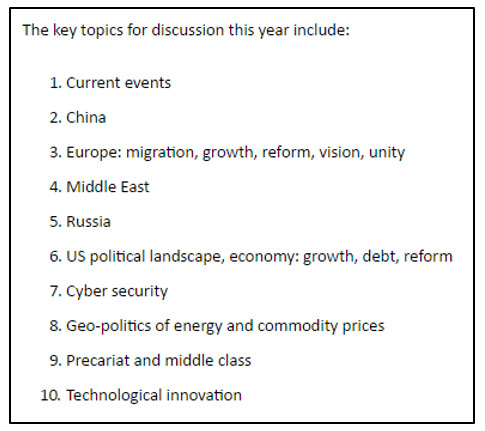 The 2016 topic list (see Figure 1) repeats last year’s trick of providing a laundry list of broad topics, rather than a sense of the actual themes being explored. The result is of course frustratingly vague, leaving outside observers with no option but to use guess work to fill in the gaps. Infowars’ Watson, for example, bravely claimed that Bilderberg would actually be discussing “how to prevent Donald Trump from becoming president, the possibility of mass riots as a result of wealth inequality, the migrant crisis, as well as the United Kingdom’s vote on leaving the European Union” (Infowars, Jun. 07, 2016). Topics 1, 2, 4, 5, 7 and 10 are so vague they tell us next to nothing, but the other topics, 3, 6, 8 and particularly 9 are less obscure. In fact the last one, “Precariat and middle class” is a dead giveaway because the term “precariat” is unique, having been coined by Professor Guy Standing from the University of London, who also happens to be on the participant list. Otherwise, it is only by looking at the participant list, particularly those attending for the first time (of whom there are 64), can we get some sense of what they might be talking about under each of these topic headings. For example, under Topic 3 “Europe: migration, growth, reform, vision, unity”, we can anticipate than any number of the participants might opine on the issue of Brexit and migration. To achieve this, the first-time participants and returning participants include a number of well-connected academic and quasi-academic voices who can opine on these matters. On the highly contentious issue of migration, for instance, the Mayor of Rotterdam, Ahmed Aboutaleb, the Deputy Mayor of Amsterdam Kajsa Ollongren, and Belgian politician Yasmine Kherbache can all be counted to put forward a positive view of Middle Eastern migration into the EU. Similarly the economic consequences of Brexit and Europe’s ongoing debt problems will also be well-supported by the current roster. Harvard and Stanford University Professor Niall Ferguson, the author of the recent biography of former US Secretary of State Henry Kissinger (now participating in his 43rd Bilderberg meeting), for example, might seem well-placed as a financial historian and professional polemicist to the plutocracy to present on this issue (though the value of his increasingly glib insights is questionable). 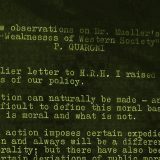 We might also expect similar contributions from the Financial Times’ Chief Economics Commentator and long-time Bilderberg participant Martin Wolf, and from first-time participants Hans-Werner Sinn, a Professor of Economics and Finance from the University of Munich and Beatrice Weider di Mauro, a Professor of Economics from the University of Mainz. But Sinn and di Mauro are no ordinary academic economists, slaving away in their respective ivory towers. Besides being lauded as an expert on debt, di Mauro is also a member of the board of Swiss pharmaceutical giant Roche and of Swiss bank UBS AG; and she was also a former member of the German Council of Economic Experts which advises the German Government and Parliament on economic issues. Professor Sinn is also well-connected, and revered even as one of the most influential economists in Germany, having served on the Advisory Council of the German Ministry of Economics since 1989. 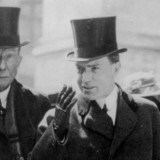 But such a discussion is unlikely to take place without significant contributions from the Ministers of Finance from Sweden, Ireland and Germany, and the representatives from the European Central Bank, Deutsche Bank, HSBC, Lazard Frères & Co., the Oesterreichische Kontrollbank AG, and other financial institutions represented in Dresden. The presence, from Europe, of the Vice President of the European Commission, two European prime ministers, and eight European ministers, will certainly be sufficient to give any discussion about Brexit some weight. Though the complete absence of any senior UK politicians from either side of the debate – Helen Goodman MP is no longer in the shadow ministry, and John Kerr, Lord Kerr of Kinlochard, is an Independent member of the House of Lords, and both oppose Brexit (Kerr most recently in the Financial Times on the eve of Bilderberg and Goodman on Twitter) – suggests that for Bilderberg the debate has moved onto how to manage the fallout from the referendum due on June 23rd. Bank of England says #Brexit would cost jobs- yes esp in Northeast where we have 150,000 exporting to EU at risk #StrongerIn. In the case of topic 6, “US political landscape, economy: growth debt, reform”, a strong exchange of opinions is likely on the election, especially between Trump’s lone Bilderberg supporter, billionaire Paypal founder and Facebook board member Peter Thiel (and Trump delegate in California) and one of Trump’s more vocal critics, Senator Lindsey Graham (who recently accused Trump of “xenophobic race-baiting” and predicted he would be a “terrible commander in chief”). Also likely to contribute pearls of wisdom on Hillary Clinton’s chances will be the well-connected Democrat operative James A. Johnson and long-time Bilderberger and close friend of the Clintons, Vernon Jordan. Kissinger, who recently met with Trump under contested circumstances – Trump claimed Kissinger had come to support his approach, while Kissinger disputed this, claiming he “did not generally agree with [Trump’s] solutions” (Time, May 27, 2016) – might also have something to offer. Indeed various assumptions can be made about who might be scheduled to speak quite simply by matching topics to new participants, many of whom are just brought in as panellists for specific topics. Thus on topic 8 “Geo-politics of energy and commodity prices”, the CEOs, senior manager sand board members of Royal Dutch Shell, Galp Energia, British Petroleum, Scottish Power and other energy companies, can be anticipated to contribute. In the case of topic 10, “Technological innovation” the most likely panellists would be first-time participants: Canadian astronaut Chris Hadfield; Carlo Ratti, Director of the MIT’s Senseable City Laboratory; and Emmanuelle Charpentier from the Max Planck Institute for Infection Biology (who is crediting with developing a technique known as CRISPR-Cas9 that could theoretically enable a scientist to “alter any gene”). As for Russia, Marta Dassù Senior Director on European Affairs at the Aspen Institute, and who has argued that Russia is supporting Brexit to weaken the European Union, is a likely speaker. Also likely to contribute is now second-time participant, Washington Post columnist and Director of the Transitions Forum at the Legatum Institute, Anne Applebaum, and her husband, first-time participant and former Polish Minister for Foreign Affairs, Radosław Sikorski, who was “for years…a leading critical voice on Russia” (DW Sep. 14, 2015). Now at Harvard, Sikorski has not abandoned his hard-line. The selection of topics, speakers and participants is designed to maximise the potential to influence policy debates. The Steering Committee choses topics they think are important, speakers they believe can be effective, and participants who are believed to be best placed to promote these ideas further in the public domain. Bilderberg’s debates and discussions can also serve as a forum for informal or “track one and a half” diplomacy where both government representatives and other non-government parties can deliberate on an issue out of the public eye. It provides an opportunity for so-called “corridor talk”, including off-the-record discussions between policy-makers, technocrats, academics and business leaders, as well as opportunities for corporate lobbying and, as has been reported in Dresden, for aspiring politicians and others to use their Bilderberg connections to lobby for jobs in other institutions. 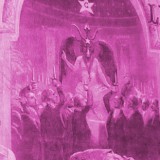 The composition of both the participant list and the discussion topics suggests that this model of Bilderberg as a venue for influence, rather than merely an excuse for lobbying, remains intact. There is however a persistent problem which threatens to undermine its effectiveness. 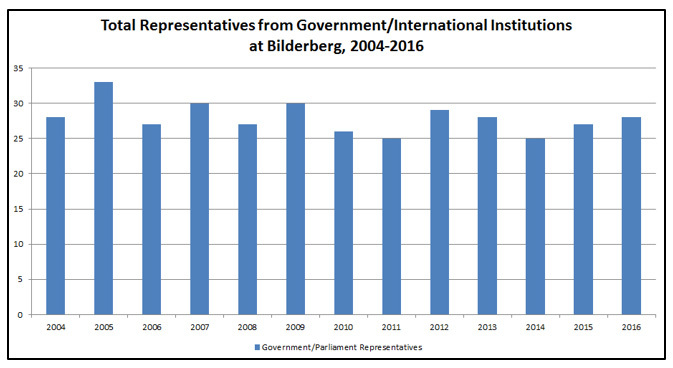 But one key statistic that people should be looking at, but are not talking about, is that for the third time in the past four years, there are no representatives from the US Government present at Bilderberg this year. Despite a significant 27-strong US delegation comprised of billionaires, influential journalists, academics, political fixers, a lone Senator, and a collection of former officials, there were no serving government officials. Not one. 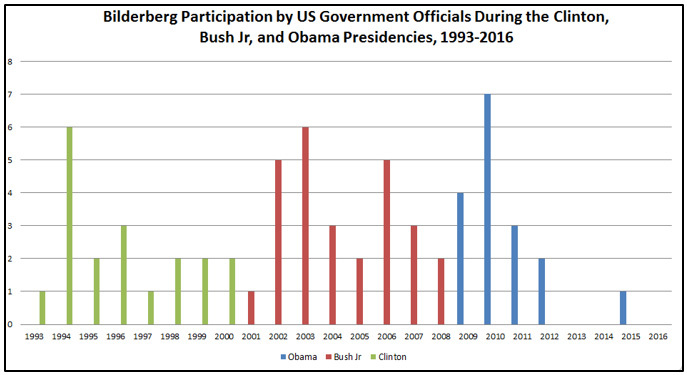 After dispatching a record number of senior officials in 2010, the Obama Administration’s Bilderberg participation has now trailed off quite dramatically (see Figure 3). No doubt the Bilderberg Steering Committee invited many of the principals at the National Security Council, and the State, Defense, Trade and Commerce Departments, but it was clearly to no avail. Back in 2014 I noted that for the second year-running the Obama Administration had failed to send any of its senior officials to Bilderberg. I speculated on a number of possible reasons why, including clashing schedules, a fear of leaks, or a jaded Obama having little interest in having his officials patronising the private conferences of the power-elite. Another possibility, raised by a commenter on my article, was what we could call the “Drudge Effect”, the reluctance to encourage bad publicity by sending key officials to an event steeped in as much conspiracy lore as Bilderberg. This also seems plausible, although in 2015 the trend was broken when Obama’s Special Presidential Envoy General John Allen attended last year’s Bilderberg meeting in Telfs-Buchen in Austria. Another reason could be official US scepticism these meetings are worth the effort, although a number of former officials from the Obama years, such as former CIA Director David Petreaus, former NATO Commander Philip Breedlove and former National Security Advisor Thomas Donilon have thought Bilderberg worth their time when out of office. As yet no clear reason has emerged, and puzzlingly the journalists of the alternative media have consistently failed to pursue this issue when speaking to Bilderberg participants, let alone even acknowledge it. But whatever the reason, it is hard believe the Bilderberg Steering Committee would be pleased with this sudden drop-off in participation by senior US officials. Helping to maintain the transatlantic relationship is the core of the Bilderberg Group’s existence. While speaking through unofficial channels is part-and-parcel of Bilderberg, the legitimacy of its exercise and the presumed effectiveness of its shaping and influencing, also rests on its ability to include serving and preferably senior government officials in its meetings. The complete absence of senior US officials in 2013, 2014 and now 2016, would be a real blow to that objective and may even been causing some Bilderberg figures some angst about its credibility. This is curious issue, one that should not be ignored, yet during each of those years Skelton, Infowars, American Free Press, other alternative outlets and the mainstream media have made no mention of it. Come on Charlie Skelton, the next time you see a member of the Bilderberg Steering Committee having a stroll outside the fence line in Dresden, why don’t you ask how the Committee feels about the lack of US officials? What’s the deal with the missing Americans? Previous story Inside Story – How powerful is the Bilderberg group? There is no doubt in my mind this Orlando shooting was staged, now that I see how it’s all playing out. In this case though it’s not a standard Thesis-Antithesis, but rather more Demthesis (Democrat agenda) and Repubhesis (Republican agenda). Demthesis: Ban guns, or at least require background checks, and maybe throw Hate-Crime legislation in there. Repubthesis: Ban Muslims, be afraid of Muslims, spy on the Mosques, build a wall, turn away refugees, wage war in the middle east, increase military spending and the Patriot act. Synthesis: Ban people on the Terror Watch list from buying Guns. It didn’t take long at all for the Dems to make that their starting point. And now Trump is calling for it saying he’s gonna sit down with the NRA on it. And we got Fox News Pundits saying it’s “Common Sense”. Don’t forget thanks to the Patriot Act and everything passed after 9/11 how insanely easy it is to get put on the watch list. You don’t have to be a Muslim, plenty of White-Male-Christians have got there for being Anti-Authoritarian. But if you are a Muslim, got luck staying off it, I’ll bet you are on it and don’t even know it. Basically this “compromise” will effectively kill the Second Amendment, the Dems won’t need anything else they are calling for. And the Islamophobes won’t need anything else either once they’ve used this to disarm every Muslim. This was the real goal all along, don’t be fooled, we need to fight this tooth and nail. Remember the first Gun Law in this country was supported by the NRA and was a law banning the newly freed slaved from owning guns. So it’s not the first bigotry has factored into restricting gun rights. But to offer my two cents on your speculation, all you claim in terms of this event being “staged” could be true,or it could be that the Orlando shooting was a discreet event planned only by the shooter, but one which both sides are rushing to make political capital from because of the scale of the killings, who was targeted and how it was done. It will take a few more events on this scale or greater before you get a real push for an Australian style ban on semi-automatic weapons. It’s all about gun control in the U.S. In 1935 gun control was introduced in China. We all know what happened less than 15 years later. Millions of Christians were slaughtered and butchered, just like it happened in Bolsjevic Russia (Lenin, Stalin), Spanish civil War (1936-1939), Cambodia (Pol Pott) and Vietnam. Know the real history and understand what is going on in the world of today. Well the US Senate just blocked a post-Orlando measure so it seems one lobby has stranglehold on this issue that resists the outrage caused by each massacre. And the gun grabber have countered with this sit in. 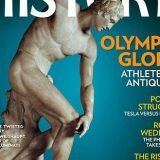 Hello again, great article. I like the fact that you have written very relevant information, without jumping off of the roof with the popular and normal “conspiracy theorist” speculative, sealed in concrete answers, but ave instead raised the questions. My 2 bits of speculation is that the then President Obama knew first hand the frivolity of attending or sending anyone from his administration. This is his silent protest, which should be speaking volumes to those becoming aware. My personal belief is he objects to what he would have no way of knowing before hand what the true political beast is about. Remember, he was basically a newbie to the Senate and politics. I believe the Whitehouse “intruder” that actually somehow made it into the Whitehouse (I think the same side of his then residence), in spite of Secret Service, was a warning to him. There was a clear absence of His wife and family from so many of his travels after that time. There were also other violations of Whitehouse security during that time. The noticeable lack of any critique of present Trump fiascos. I remember Obama saying, amidst the conspiratorial and “prophetic” he was seeking a third term( yea, what happened to those so called “prophets” who all parroted and regurgitated this? )that Michelle would kill him him this were possible and he were to attempt such. Let’s see Trump if attends. Lol. Yea, right. “If”? The question is how many people will he insist that the Bildeberg group invite (because he’s crashing anyway)from his posse. Well, this year’s meeting is in Chantilly Virginia. I very much doubt Trump himself will attend, notwithstanding his belief that he could kill someone without losing his base, going to Bilderberg might be a bridge too far. But it will be interesting to see if any of his officials turn up there. As it is, two of Trump’s Cabinet members are Bilderberg alumni: Secretary of Energy Rick Perry attended the 2007 Bilderberg meeting, and his Secretary of Defense, James Mattis participated (and probable presented) at the 2015 meeting.